Graham Foundation > Grantees > Association of Collegiate Schools of Architecture, Inc.
Clockwise from upper left: Columbia students working in East Harlem with Real Great Society Urban Planning Studio, 1969. 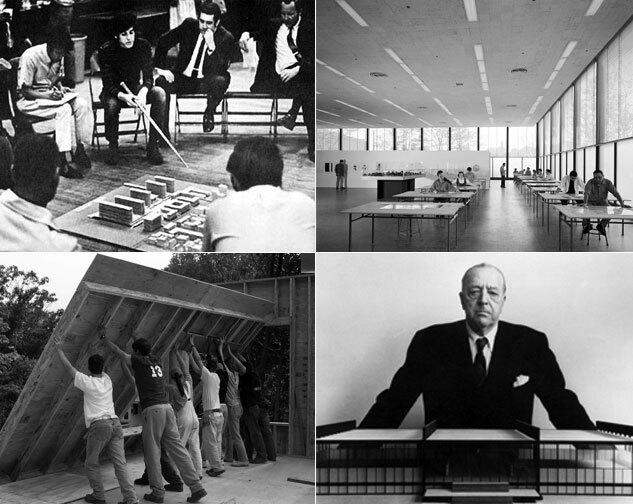 Mies Van der Rohe with model of Crown Hall, the architecture building at Illinois Institute of Technology in Chicago; Hedrich-Blessing (Firm) Photographer; courtesy Chicago History Museum. Interior of Crown Hall, the architecture building at Illinois Institute of Technology in Chicago, 1956; Hedrich-Blessing (Firm) Photographer; courtesy Chicago History Museum. Students in Yale's First-Year Building Project, New Haven, CT, 2003; courtesy of Yale University School of Architecture. 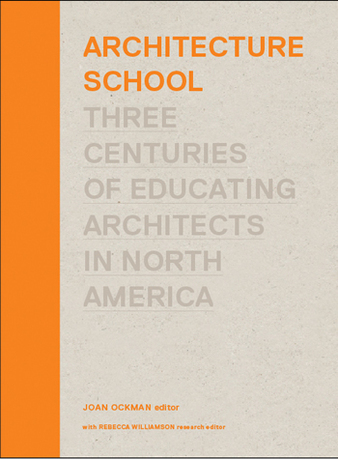 To mark its centennial anniversary in 2012, the Association of Collegiate Schools of Architecture presents the first comprehensive scholarly history of architectural education in North America. This seminal 400-page book includes a chronological account of professional training in architecture in the United States and Canada from colonial times to the present, as well as an alphabetical lexicon of articles on thematic topics. Edited by Joan Ockman with the assistance of Rebecca Williamson, and generously illustrated with documentary drawings and photographs, as well as new graphic material, it includes contributions by three dozen distinguished scholars and educators from across North America. Joan Ockman serves as editor for Architecture School. An architecture educator, historian, and widely published author with three decades of experience editing architectural publications, Ockman began her career in the 1970s at the Institute for Architecture and Urban Studies in New York, where she edited Oppositions journal and the Oppositions Books series. She began teaching at Columbia University's Graduate School of Architecture, Planning, and Preservation in 1985, directing the Temple Hoyne Buell Center for the Study of American Architecture there for fourteen years until retiring in 2008. Her award-winning anthology Architecture Culture, 1943–1968 (1993), currently in its fifth printing, has become a classic textbook used in many schools. Among her other books are The Pragmatist Imagination (2000), Out of Ground Zero (2003), and the FORuM Project series (2007–09). Recipient of an AIA award for collaborative achievement in 2003, she served as acting director of the Van Alen Institute in New York in 2009. The Association of Collegiate Schools of Architecture (ACSA) is a nonprofit association founded in 1912 to advance the quality of architectural education. Membership in ACSA includes 134 accredited and candidate architecture programs in the United States and Canada and 70+ affiliate programs at colleges and universities worldwide. Together, ACSA member schools comprise over 5,000 faculty teaching in excess of 30,000 undergraduate and graduate students. Over 500 individuals, design firms, and industry groups also support ACSA. ACSA maintains a variety of activities, including publication of the Journal of Architectural Education (JAE). Unlike most blind peer reviewed journals, the JAE supports work that advances the field in a variety of media, reaching beyond conventional academic research to engage architectural projects at all scales. This mission is grounded by a commitment to strengthening the understanding of architecture as a cultural practice, defined by experimentation, inquiry, and a desire to remake the world.